Before the clock struck midnight, I already had in my mind that 2016 was going to be an AMAZING year! My top 3 goals were to travel A LOT more, save and make (more) money and become more active. Of course I got right to work and started creating my vision board. However, by the end of the first quarter things just weren’t adding up. I was frustrated because I created this grandiose visual plan for the year, but things weren’t jumping off. I beat myself up about it for days, but I finally came to my senses. After getting real with myself and talking things over with my Starting 5, I realized the issues(s). If you’re anything like me this post will help get you back on track and help make 2016 a productive and prosperous year. 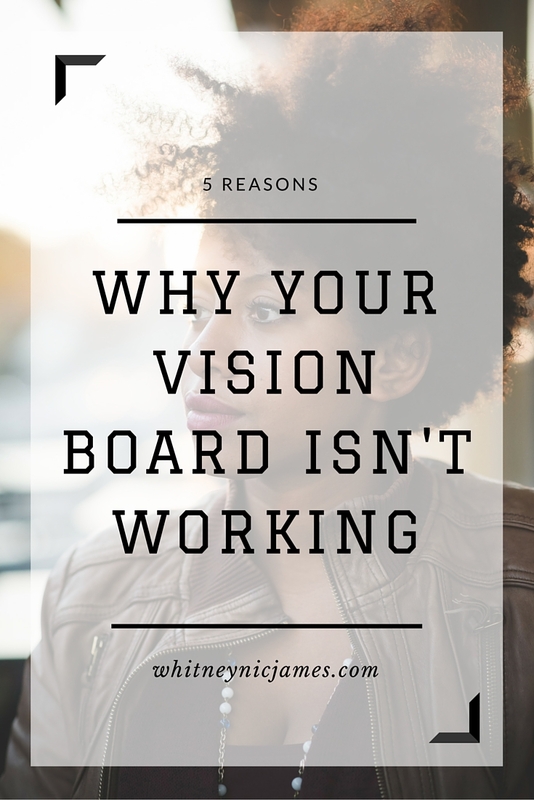 Here are 5 reasons why my vision board wasn’t working and why yours may not be working either. 1. You can’t see it. | You need to place your vision board somewhere you can actually SEE it. We take hours, sometimes days, gathering images and quotes for our boards. So why not show it off? I placed mine above the wall over my desk, but moved it to the closet when we rearranged the room. I had every intention to hang it back up, but as time went on it stayed leaned against the wall in the closet. Vision boards need to be somewhere visible. Period. If you make a smaller 8 1/2 x 11 version, you can even put it in a picture frame on your nightstand. Think about it, how can you achieve something if you don’t even know what the goal is? 2. The images are boring. | Vision boards are probably the best visualization tool we can create. Our minds are wired to respond to visual stimulation. Therefore choosing powerful and intriguing images to represent our goals is vital. Let’s be honest, no one wants to look at boring and drab images everyday. My first vision board wasn’t well thought out and the bland images proved that. Get creative and make your vision board come to life with exhilarating imagery! 3. It’s not specific enough. | If you’re not specific about your goals they’ll be harder to achieve. On my 2014 board I had a phrase that read, “work out at least 30 minutes 3 time a week”. That is very specific. Unfortunately I didn’t live up to the phrase, but it wasn’t because the goal wasn’t clear. It was because I didn’t take enough action to make it happen. 4. You’re not taking action. | Vision boards don’t work by themselves. Once they’re created, that’s when the work really stats. We’re responsible for making our boards work for us. How do we do that? By taking action! It’s great to have pretty pictures on your board, but if you don’t do the work to achieve the goals that’s all you’re left with – pretty pictures. Do the work and take action; you’re worth it! 5. You don’t look at it enough. 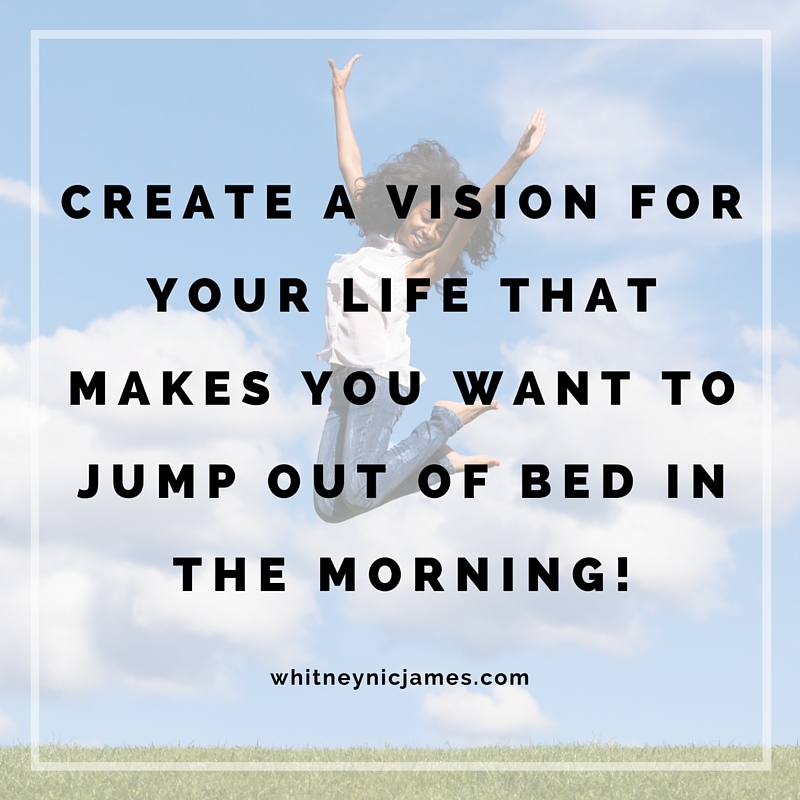 | In this post I mentioned the importance of looking at your vision board everyday. I now look at mine every morning and every night before bed. If I’m working from home, I look at it several times throughout the day. One year I actually took a picture of my board and made it my iPhone screen saver. It was a great reminder for me to keep my daily actions aligned with my vision. So tell me, did you create a vision board this year? If so, how are you making your vision board work for you? Let me know! Don’t be afraid to reevaluate your goals, recreate or tweak your vision board and start taking action. If you need more inspiration on how to create your vision board, be sure to sign up for my newsletter. I’ll be sending out an extra dose of vision board inspiration, pretty pictures included, in a few weeks! Until next time, be blessed and stay safe…XO! Thanks, Rachel. And yes, those vision boards help keep me focused for sure! Great points! My vision board has been in the “almost done” stage for months which says a whole lot about where I stand with many of my goals and action items for this year.